Wish you would enjoy the magnificent natural beauty in raw of Okushiga-kogen. We are looking forward to welcoming you with our whole-hearted hospitality and service. and the comfortably heated-swimming pool. Fantastic displays of modestly shinning fresh leaves in Spring, and proudly alluring red and yellow forest in Autumn. from Okushiga-kogen virgin beech forest. lots of fun activities as if you were in paradise! various parts of Japan, are meticulously cooked to Japanese, Chinese, and Italian cuisines respectively by our chefs. Our natural and friendly service will help make your stay ever more relaxing. 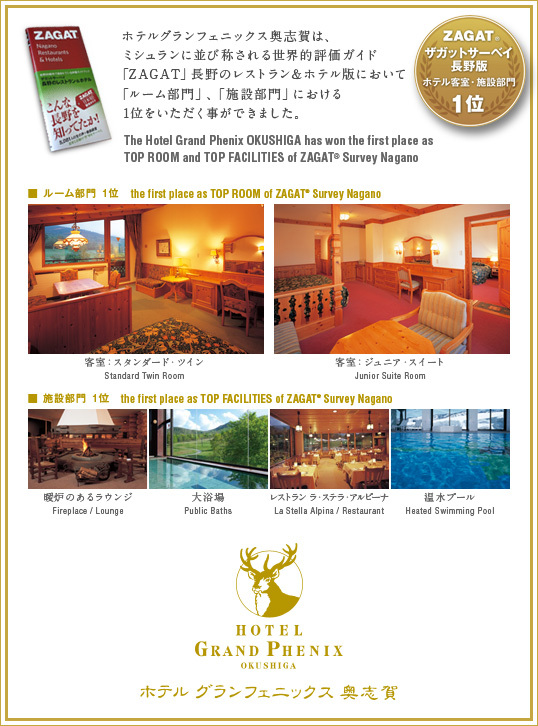 Okushiga mountains are the only ingredients that make our hospitality so special. who would be there for you anytime you ask! 2018-11-26　〈Seasonal special offer〉 Courtesy bus service from Nagano station to the hotel, and the other way around. Copyright All Reserved Zuika International Co., Ltd.